Pick the Pink Pixie glitter bow this Valentine's day! 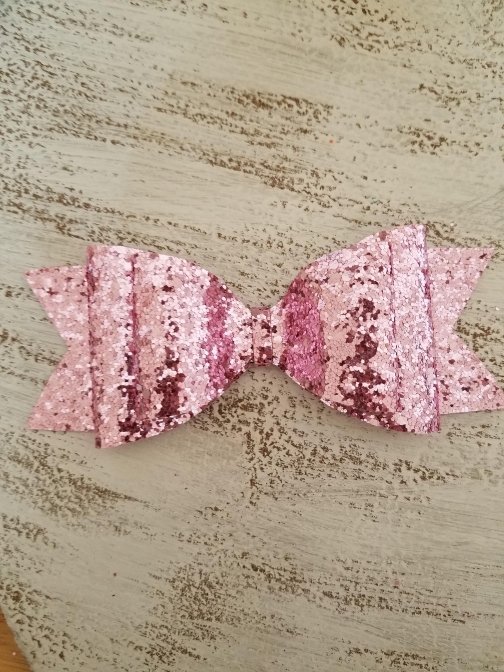 Valentine's Day Collection of our Glitter Hair Bows: These glitter hair bows are spectacularly sparkly and eye catching! Be prepared to fall in love with this collection of Valentine's Day bows. Bows are 100% handmade in Alexandria, Virginia. Each bow is hand drawn, cut by hand and assembled in house. Hair bows are typically finished with an alligator clip, however other options are available (with different pricing). Care: Please keep bows away from water to protect the fabric from any damage. Over time, edges may begin to fray due to the nature of the fabric. In this case, simply trim the edges with a fabric scissor. Safety: Please take precaution to ensure that young children are not left unsupervised when wearing or handling any hair accessory. Although young children will love their hair bows, the hair bows are not toys and are not intended for children to play with. Small parts and materials can pose a choking hazard for your children if swallowed. Please remove bows when children are sleeping or out of adult eyesight. Item ships from: Alexandria, VA, US. Please allow 1-5 days for me to process and ship your order. Every effort will be made to ship orders with 24 hours! Orders will be shipped using the United State Postal Service (USPS). Please add $5.95 (0-6 bows) for shipping costs to anywhere in the United States. Please add $2.95 for additional items (7-12 bows). Please feel free to contact me for expedited shipping inquiries.. I gladly accept returns, exchanges, and cancellations. Custom orders may not be returned or exchanged unless merchandise arrives defective or damaged. Buyers are responsible for return shipping costs. If the item is not returned in its original condition, the buyer is responsible for any loss in value. Please contact me if you have any questions about your order.